Add to your current sets or start new ones with the different surprises waiting in the LEGO® City Advent Calendar! Open a numbered door each day and find out what’s waiting behind it for you. Will it be a vehicle or maybe even a brand new minifigure? Perhaps even Santa? The only way to find out is to open the doors, a day at a time! Price is 32% below the initial Lego retail price, a € 8.00 discount! This comes down to 6.85 cent per brick. The LEGO® City Advent Calendar (60155) Lego set is no longer directly available from the sites below. However, 3rd party partners of these sites might still have the set available. Alternate description Celebrate 24 fun days with the LEGO® City Advent Calendar! 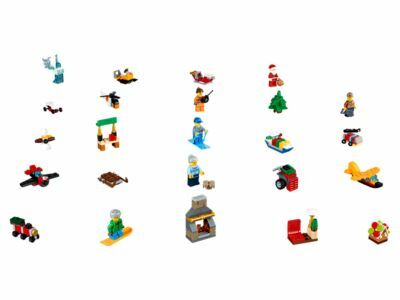 Includes 6 minifigures: snowboarder kid, grandma, 2 coast guard members, jungle explorer and Santa. Features 24 different items including buildings, vehicles, seasonal items and minifigures. Open each ‘door’ to reveal the surprise for the day. Collect all the minifigures to add to your collections or sets. Celebrate the holiday spirit in LEGO® City with this fun Advent calendar.